Although never as popular in the mainstream as other comic strip characters such as Snoopy or Garfield, the Moomins – the creation of Finnish illustrator Tove Jansson, who last year had her 100th anniversary celebrated – have a fan base of their very own, whether it’s through Jansson’s books and comic strips or even the multiple television adaptations that were broadcast for international audiences (this reviewer, for instance, has vivid memories of the early-90s anime series produced in Japan). 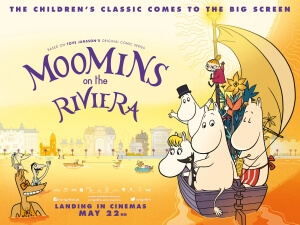 It is primarily for this fan base, we assume, that the commemorative Moomins on the Riviera film adaptation, based on a popular story from Jansson’s own bibliography, was made. For everyone else, the results will certainly be far more mixed. Despite knowing of said anime show, this reviewer doesn’t have much knowledge of the works of Jansson outside of the strange characters and designs she had created – and honestly didn’t even watch that show as religiously as you may think. It’s been a while, then, since the characters have made any sort of appearance in the mainstream subconscious so one can imagine how the nostalgia factor could overshadow the genuine anticipation for this film otherwise. Watching it, years after last knowing about the Moomins as an impressionable child, it’s striking to remember how oddball the overall tone is. Almost every character has at least one major eccentricity about them, and they all seem to live in this strange bizarre world where to be strange and unconventional is the norm. It pushes aside a good deal of the logic to just let the oddness take over, and it can be strangely relaxing without any fear of being insulting. What this may lead to, however, with audiences more used to a bit more spark in terms of story, characters and overall situations in family films, is an overwhelming sense of boredom. This is a very slow-moving picture, basically comprising of a series of vignettes with the central Moomin family – the top hat-wearing Moominpapa (Nathaniel Parker), the apron-wearing Moominmama (Tracy Ann Oberman), the glitzy Snorkmaiden (Stephanie Winiecki) and the impressionable do-gooder known as, erm, Moomin (Russell Tovey) – placed in the extravagant environment of the French Riviera, and simply going from there. Concrete storytelling simply does not exist here, which can certainly turn a lot of impatient viewers off but leave anyone else who wants a nice feeling of atmosphere feeling satisfyingly enchanted. It soon becomes apparent that the target audience, outside of Jansson fanatics, is indeed very young children. The inoffensiveness, light humour and especially its writing – or at least in this English dub – are all near identical to a typical CBeebies programme, in as good a way as we can describe. Even the voice acting sounds like something directed to toddlers, with Tovey in particular sounding like a bedtime storyteller at times. We can imagine it will be that particular age group that will probably warm to this film more than others, who may quickly become frustrated by its lack of truly challenging material and eccentric nature. On the flip side, it’s refreshing to see a children’s film look as gorgeous as it does here, nixing the now-standard CG approach and instead retreating itself to 2D traditional animation – and God bless it for doing so. From the very first frame you can tell that this is a beautifully designed work of art, with minimalist backgrounds and impeccably creative designs for the good majority of its characters. Jansson’s work is wonderfully realised here, at least from a visual standpoint, in a way that truly makes it sad to know that this type of animation is a dying art, what with almost everything now being done in 3D graphics and photo-realistic designs. Above all, Moomins on the Riviera acts as a thank-you note to the legions of fans who have supported Jansson’s work over the years and will most likely continue to do so for the foreseeable future. For everyone else, it’s destined to be a highly unusual alternative family film which, though not for everyone, is a worthy enough distraction for young children while you go off and have a bit of alone time. 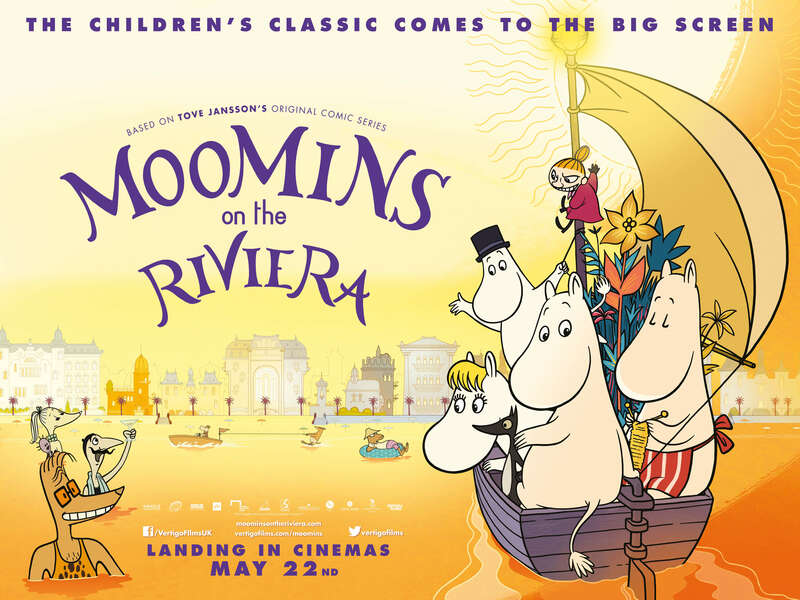 Moomins on the Riviera is a highly inoffensive children’s film designed to please loyal fans of Tove Jansson’s work as very young children, and while it’s certainly not for everyone – some will be turned off by its lack of concrete story and oddball nature – it is harmless enough as an 80-minute distraction for your child.